Walmart started swimming upstream long before the digital revolution, and some of our key leaders confirmed at the 47th annual Shareholders meeting that this business strategy is still working for us today. There are earthshaking changes happening in retail, but we believe that by staying aggressive, being nimble, moving with speed and taking risks, we can stay ahead of the competition and create a better shopping experience for our customers – both in stores and online. We have an advantage no one else has – our amazing associates, said Greg Foran, president and chief executive officer, Walmart U.S. When we create opportunity and empower them to succeed, we delight our customers. Jacqui Canney, executive vice president, Global People Division, noted that it all starts with three things: hiring the best, providing training and experiences so our associates can be their best, and offering limitless career paths to fit every person. “At Walmart, we’re finding new and different ways to serve customers by combining the passion of our people with the power of technology,” said Judith McKenna, EVP and chief operating officer, Walmart U.S.
Technology is helping us in so many ways. But the real difference maker has always been our people. “What if associates wanted to make a stop on their way home, deliver a dot-com order to a customer and earn a little more for doing it?” Judith asked. “It’s an idea we wanted to explore more. So we’ve begun testing an associate delivery program in a few stores that gives our people that option,” she said. Associates can download an app and receive notices if there are customers along their route home who are waiting for an online order. If the associate wants to make the delivery, he or she can. Everything we do is with the customer in mind, and busy families in particular need shopping to be easy and enjoyable. David Cheesewright, president and CEO, Walmart International, offered a great example: the expansion of online grocery pickup in the U.S. “It’s a huge time saver for anyone with a busy schedule – especially a mom with small children. She can order online, choose the pickup time and location, and an associate will load everything in her car." As we provide for our associates and customers today, we’re also planning for the future. And that means taking care of our suppliers and the planet. Supporting small and women-owned businesses has brought our customers and Sam’s Club members some really outstanding products, said Kathleen McLaughlin, senior vice president and chief sustainability officer. We’re also working with our suppliers to remove a gigaton of greenhouse gas emissions from our supply chains by 2030. 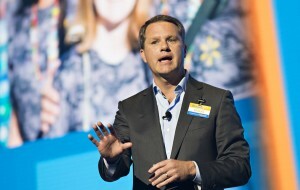 Doug McMillon, president and CEO of Wal-Mart Stores Inc., wrapped up the conversation. “Looking ahead, we will compete with technology but win with people. We will be people led and tech empowered. We will win because we are purpose driven with clear and meaningful values and an effective and resilient culture.